About I was fairly reliably informed that this was a mother and daughter but if not they were very friendly towards each other as they met up and nuzzled. 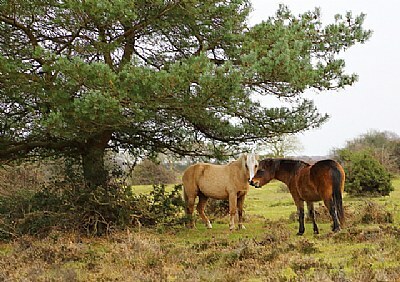 They are two of the many New Forest ponies/horses that roam around this very large forest. Some are wild but there are those who have owners that let them out to graze and who then round them up later to stable them. Jerry, thank you. I have made another comment against this shot separately because I forgot how to reply. Best wishes to you. Thank you Jerry Thompkins for your recent acknowledgement on this shot. It is sometime now since my last posting but I have very fond memories of this site as Usefilm and Imageopolis. I stopped contributing because of the need to resize my shots and the problem of this to me was tedious due to my lack of knowledge in this procedure and my always getting it wrong. Best wishes to you and anyone else who remembers me. Lovely work Ray...kudos to you! Thank you so much Goran, hope to return here some day. Best wishes. Very nice shot. Content is certainly interesting these beautiful animals. Congratulations on the award. Many thanks Robert, hope you are keeping well these days. This year,for me, has been a very sad year with the loss of three family members and radical changes to my personal life. I keep thinking of returning to this site but I cannot quite bring myself to commit to it. Maybe one day. A beautiful mood Ray,love the composition. Many thanks Ciprian. I will be back on the site eventually, I have things going wrong in my life just now and I must sort them out before I get on with the rest of my life. Best wishes to you. My dear sweet Pare, I will try and get my act together soon, I have another problem to deal with following my brother's death. Miss you too sweetie. Best wishes always. Greetings my friend, and miss you .. Thank you again Ania, hope you are keeping well. HUGS and best wishes. Thank you Czeslav, I will catch up soon, I am taking a short break. Best wishes to you. I had already thank you Jill, still another thank you is never too much :) Not many brain cells left in my head these days, memory is going Take care and be well. Thank you so much Breda, best wishes always. Thank you so much Jill. Best wishes to you as always. Very romantic scene and sweet couple, marvelous colors and great light, touching mood and splendid captured, regards. Thank you my dear friend. Be well, best wishes always. I hope life in Bulgaria is treating you kindly Jill. I am just going to have a look at your view. Be well, best wishes always. Thank you David. All the best to you my friend. Many thanks Salvador. Best wishes always. Lived most of my life in Dorset so know the new forest well. Came to the mountains of Bulgaria 6 years ago. As you will see from latest pic. my view is out standing. Hope you stay safe and dry.Best wishes to you. Excellent image selection. A climate of tranquility makes you want to be there. Very cute picture of field. Greetings friend. Splendid capture, Ray, and a remarkable composition. Thank you again Michele. All the very best to you. Thank you Harry. Oh Harry I'm afraid as a horseman I would make a good bricklayer:) I think these two were wild and they can be very unpredictable so the closest I will go to them is about 2 metres and always always trying to judge their mood :) Very best wishes to you my friend. Many thanks to you Fabrice, very best wishes. Thank you Adam. It was lovely to watch the darker horse come up to join the other one and to watch them greet each other. All the best to you my friend. Many thanks Jill. You live away from the UK now?? We haven't been able to go to the New Forest for several weeks now due to the terrible weather we are experiencing just now. Roll on Spring and some dry weather because the area is so beautiful in normal times. Best wishes to you. A nice image of two sweet horses and a good about. Did you ride on them ? Nice countryside shot with these two friends.. for sure ponys or horses prefer not be alone in a field..
beautiful shot, so glad the pony's and the countryside are still just as beautiful as I remember.